This is how our fortress look like all the time. And there is no chance to win against it as our highest player only level 125. We already change it to very easy and its still the same. Can someone explain me this? 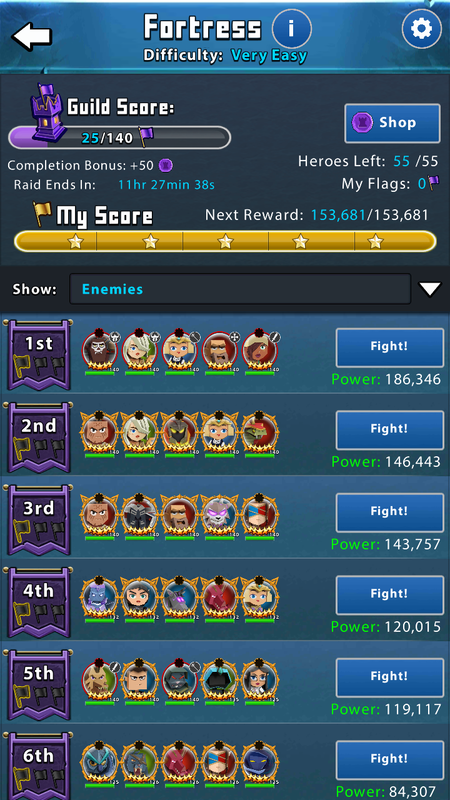 The higher average league for tournament your guild members are in should correlate to that. Some changes occurred to fortress with the last update. We were told this morning that the fortress issues are being looked into. I agree with you! But many are unhappy about the struggle now to complete it. I personally prefer the challenge in return for better rewards. I ️ gold! Something is indeed wrong with fortress, it in no way reflects teams in tourney as its meant to. Completing it on harder is difficult for my guild. The gold is nice but lower guilds need the fortress rewards to level up toons. The lines aren’t even lines that people use. It seems like nearly every line is an auto-line (highest powered team that someone has). We failed to finish it 2 days in a row after the change becuase people were used to just hitting a couple of lines and thats it. Now we have to actually put a little effort in. It’s annoying. But also, if majority of those members in high powered guilds are not doing RT and in like copper or silver tier or something, then the lines in fortress will mainly be high powered repetitive arena lines… Which makes it… Kinda silly. Actually I blame the programmer that tweaked the settings in a sandbox server and ran apparently none / minimal testing into how about actual guild made up of members of various ability and progression would cope with the sudden influx of lines that are so strong and super powered throughout the whole fortress. Some people have 5 - 10 heroes built and beyond that struggle to put together lines to hit the same meta over and over and over. But that takes too long to write, is slightly rude and no one is going to pay any attention.